​Pelletier, J., Gélinas, N., Potvin, C. 2019. Indigenous perspective to inform rights-based conservation in a protected area of Panama. Land Use Policy 83: 297-307. Pelletier, J. Siampale, A., Legendre, P., Laporte, N., Jantz, P., Goetz, S. 2017. Human and natural controls of the variation in aboveground tree biomass in African dry tropical forests. Ecological Applications, 27(5);1578–1593. ​Pelletier, J. , Gélinas, N, Skutsch M. 2016. The place of community forestry in the REDD+ landscape. Forests, 7(8), 170; doi:10.3390/f7080170 Special issue: REDD+: Politics, Interplays and Impacts. Pelletier, J., and S.J. Goetz. 2015. Baseline data on forest loss and associated uncertainty: advances in national forest monitoring. Environmental Research Letters 10 021001. Pelletier, J., Martin, D. & Potvin, C. 2013. REDD+ CO2 flux estimation and reporting for early actions: dealing with uncertainty Environmental Research Letters, 8, 034009. Pelletier, J., Codjia, C., Potvin, C. 2012. Traditional shifting agriculture: tracking forest carbon stock and biodiversity through time in western Panama, Global Change Biology, 18, 3581–3595. Sloan, S.P. and Pelletier, J. 2012. How accurately may we project tropical forest-cover change? A validation of a forward-looking baseline for REDD. Global Environmental Change, 22: 440-453. Pelletier, J., Ramankutty, N. & Potvin, C. (2011) Diagnosing the uncertainty and detectability of emission reductions for REDD+ under current capabilities: an example for Panama, Environmental Research Letters, 6: 024005. Pelletier, J., Kirby, K. R. & Potvin, C. (2010) Significance of Carbon Stock Uncertainties on Emissions Reductions from Deforestation and forest Degradation in Developing Countries. Forest Policy and Economics, 12 (7): 497-504. Oestreicher, J. S., Benessaiah, K., Ruiz-Jaen, M. C., Sloan, S., Turner, K., Pelletier, J., Guay, B., Clark, K. E., Roche, D. G., Meiners, M. & Potvin, C. (2009) Avoiding deforestation in Panamanian protected areas: An analysis of protection effectiveness and implications for reducing emissions from deforestation and forest degradation. Global Environmental Change, 19: 279-291. Fig 1. Distribution of miombo woodlands in sub-Saharan Africa. These cover between 2.7 and 3.6 million km2, including dry miombo, receive less than 1,000mm of annual rainfall and wet miombo, receiving more >1,000mm and having higher tree species diversity. This is the first field-based large-scale assessment of vegetation changes for the miombo region, using nation-wide re-measured permanent plots for the Republic of Zambia. Fig 2. Four sensitivity scenarios on the growth rate of forestland remaining forestland. 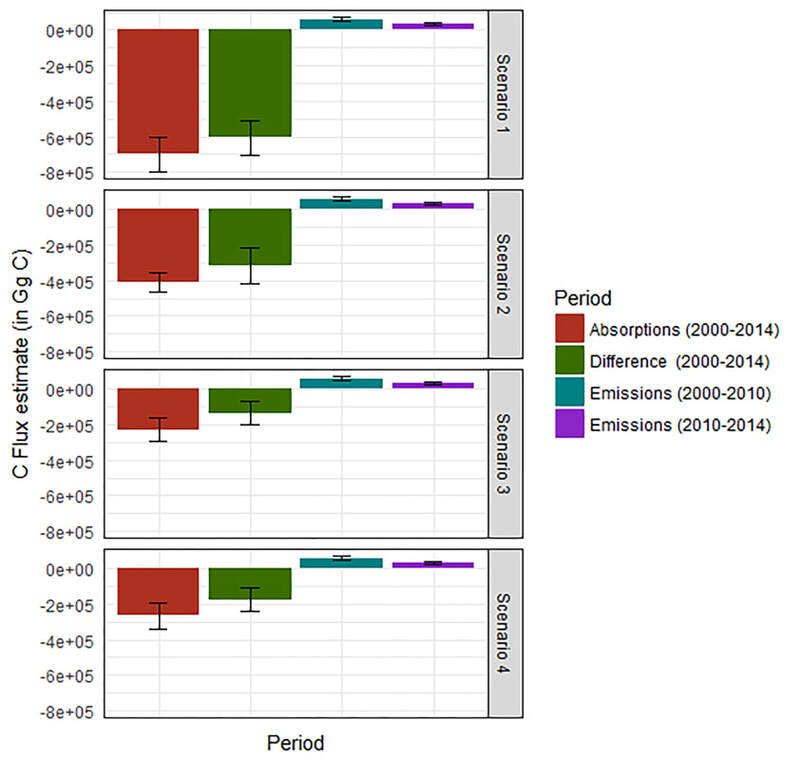 In all cases, we quantified a carbon sink despite large emissions from deforestion over the 2000-2014 period and accounting for uncertainty through error propagation.